This word means “tongue twister” in english and perhaps there’s some subtle difference in meaning for the volunteer work that I do at the library (Biblioteca Sala Borsa). Since I come to Italy two months at a time in each spring and fall (if I can manage it) I need something to do with my time other than be just a tourist which, after all, gets pretty boring after a while. So this is the second spring where I have been a volunteer in this program. 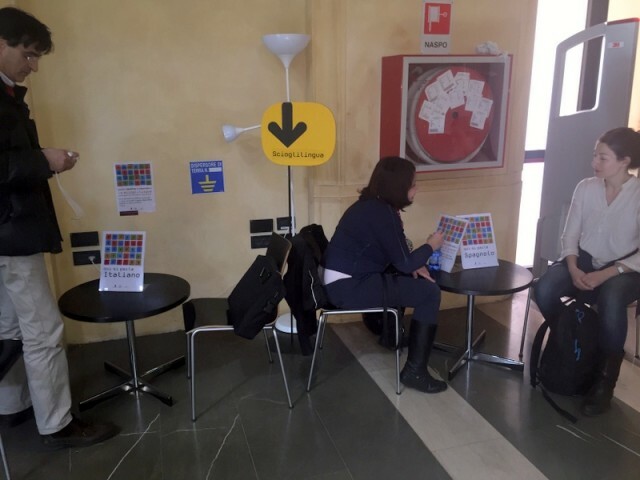 Two afternoons a week (Tuesday and Thursday) I go to this beautiful library where I have conversations with one person at a time, in English, an hour per person for 3 hours. I noted that they now have expanded the program to two tables this year and am told that one can reserve a space only every other week. It must have become quite popular. Last week was the first week of this activity. I remember best last Thursday when I had conversations with a young woman from the Ukraine, a guy from Argentina and an Italian. All spoke reasonable English although I have had instances where someone spoke very little English and I had to exercise my Italian as well. I met my friend Gianluca there last year when he came by for an hour. This year I’m also participating in the program in Italian. It’s in some ways better than having conversations with friends because I receive more corrections and therefore learn more during the hour than in 3 or 4 hours with friends. 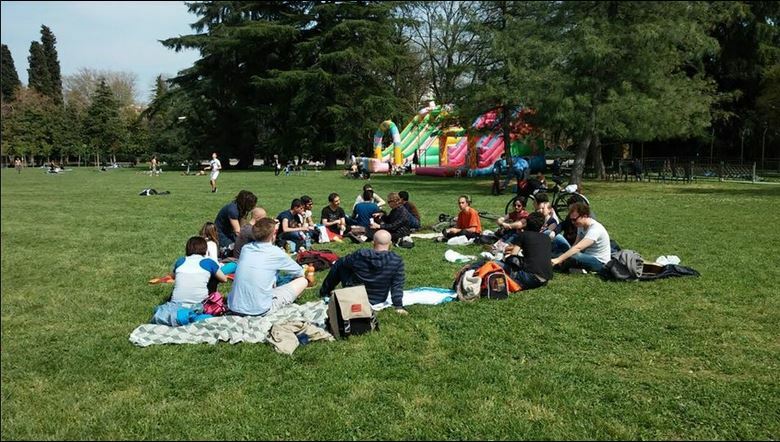 As an aside, I also went to an event in Giardini Margherita – a really great park just outside the walls with a group from a Facebook page “Tandem language learning in Bologna”. It was an interesting outing. Most people that I met when I arrived spoke English and I’d say about 60 percent were Italians. I did however meet people from China, the U.S., England, Brazil and Iran. 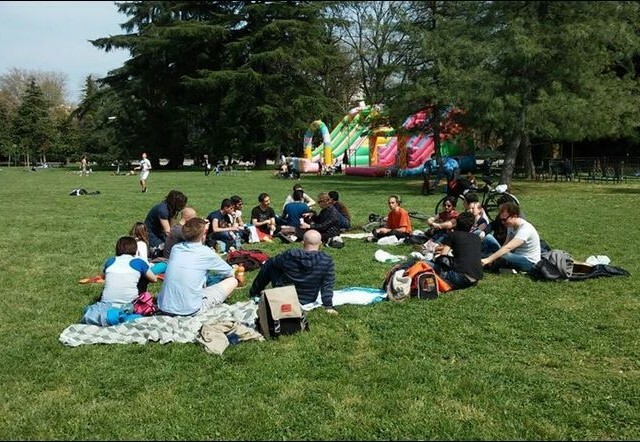 Unfortunately we migrated from the meeting place near the entrance to a grassy area where we all sat on the grass. This makes it pretty difficult to engage in conversation with very many people because it’s difficult to get up and move around. So I had interesting conversations with two Iranians and a Brazilian seated nearby. All spoke very good English but little Italian. They were all classmates studying for masters degrees at the University of Bologna and all classes were given in English. I asked the Iranians what they thought of the proposed nuclear deal. They said that they hoped that it would go through but I was surprised that they said that lifting of sanctions would have little effect on most of the population. Only the elites would really benefit. They also said that it would certainly be tricky since the Grand Ayatollah (and supreme leader) still holds most of the power in the country. This entry was posted on Monday, April 13th, 2015 at 4:54 am	and is filed under Culture, Language, Travel. You can follow any responses to this entry through the RSS 2.0 feed. You can leave a response, or trackback from your own site.